It was a cold, grey March day in 2009 when Martin and I were at the Wannsee Villa near Berlin. We were with the filmmaker Michael King and his crew to film Martin at the villa where the “Final Solution to the Jewish Question” had been discussed and finalised, on 20 January 1942. Michael’s film The Rescuers, Heroes of the Holocaust, focuses on the stories of some of the diplomats who rescued Jews, and the descendants of some of those who had been rescued. We were in Wannsee to give context to what befell those who were not rescued. “At the Wannsee suburb of Berlin, German officials gathered on 20 January 1942, to discuss the final destruction of European Jewry. They also noted … what they believed to be the precise number of Jews still to be killed. The ‘low’ figures for the Baltic States indicate their knowledge that so many thousands had been killed already. 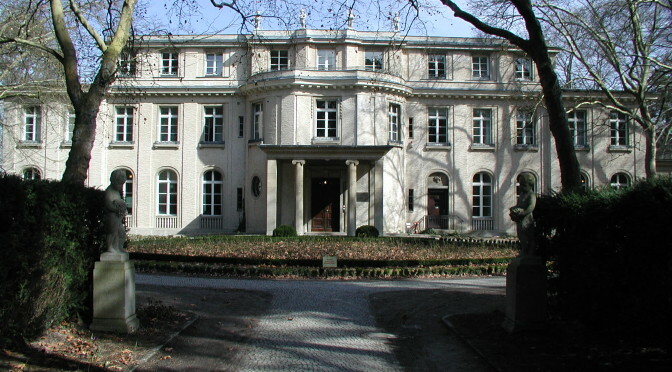 At the Wannsee Conference plans were made for what was called the ‘Final Solution’, to be carried out by means of slave labour for all able-bodied Jews, the separation of men from women, and mass deportation.